Yesterday I received the new strobe I ordered from Adorama. 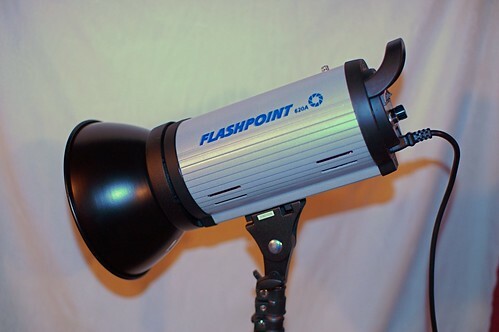 It is a Flashpoint 620, giving me a maximum 300 watt-second flash, with variable power in stops from full down to 1/8. It also has a 2-stage modeling lamp letting me have either 75 or 150 watts for seeing where the light will fall. The strobe will trigger either via a 15' wire or from the infrared signature of my on-camera flash. Slick, no? Well I unpacked and set it up last night, eager to test it out. I aimed it at my tripod head, set it to 1/2 power, set my camera to ISO 200, f/5.6, and shutter at 1/150 of a second, and white balance to flash. I take the picture and observe that the flash did indeed fire. My picture is ... black. Lens cap on? Nope. WTF? I crank the shutter speed down to 1/80 and shoot again. Black. I set the flash to full power, guestimate its distance from the subject to be 18", then set the ISO to 400 at f/2.8 (well below the capability of the 18-200 mm Sigma I want to use in the studio). I take another exposure. I see the tripod, but it is a bit underexposed. Time to stare at the settings. It seems while I was in full-blown experiment mode a while back I set the Flash Compensation to -3.0 and the Exposure Compensation to -5.0. Then I got interrupted and forgot about it. Sort of makes me wonder just what sort of shots I could have gotten of those belly dancers if my camera had been set properly, and not seriously underexposed? Well, my status as a nOOb is still valid. But I will not make that mistake again, and there was no real harm done. It's not like I earn my living this way. I can afford a mistake now and again. It just goes to show you that having good gear does not make you a good photographer (but it helps). Hahahahaha! Yeah, I know. But the font I am using made the 00 look like oo so rather than eff around with fonts I used OO.